Los Angeles, Calif. (February 12, 2019) CJ 4DPLEX (www.cj4dx.com), the world’s leading cinema technology company, announced today that Marvel Studios’ “Captain Marvel,” is coming to theaters in the ScreenX format on March 8, 2018. “Captain Marvel” will be the third movie from Marvel to be converted into ScreenX, and the latest collaboration between The Walt Disney Studios and CJ 4DPLEX, following the globally successful ScreenX release of “Black Panther” and “Ant-Man and The Wasp.” “Captain Marvel” stars Brie Larson in the title role and is directed by Anna Boden and Ryan Fleck. ScreenX is the world’s first multi-projection theatre technology that allows a 270-degree panoramic movie watching experience. ScreenX allows the audience to go beyond the frame of the traditional movie screen, utilizing a proprietary system to expand the center screen image to the side walls, surrounding audiences with imagery and providing a sense of being inside the movie. ScreenX has quickly enhanced its international reach, successfully screening Hollywood blockbusters and local feature films alike, including a record of eight Hollywood blockbusters released in ScreenX in 2018. In the past 12 months alone, ScreenX has seen a surge in the number of ScreenX installed auditoriums, which have grown to 200, a more than 50% increase year-over-year and will nearly double its footprint with the recently announced expansion plan with the Cineworld Group to open 100 locations across the U.S. and Europe. Marvel Studios’ “Captain Marvel” is produced by Kevin Feige and directed by Anna Boden and Ryan Fleck. Louis D’Esposito, Victoria Alonso, Jonathan Schwartz, Patricia Whitcher and Stan Lee are the executive producers. The story is by Nicole Perlman & Meg LeFauve and Anna Boden & Ryan Fleck & Geneva Robertson-Dworet, and the screenplay is by Anna Boden & Ryan Fleck & Geneva Robertson-Dworet. “Captain Marvel” opens on March 8, 2019 in U.S. theaters. CJ 4DPLEX is a leading, next-generation cinema technology company, headquartered in Seoul with international offices in Los Angeles and Beijing. The company has created immersive film technologies for theaters worldwide that include ‘4DX’, ‘ScreenX’ and ‘4DX with ScreenX’ for consumers to experience films in ways that were never before possible. 4DX provides moviegoers with an immersive, multi-sensory experience, allowing the audience to connect with movies through motion, vibration, water, wind, snow, lightning, scents, and other special effects that enhance the visuals on-screen. Each 4DX auditorium incorporates motion-based seating synchronized with more than 20 different effects and optimized by a team of skilled editors, maximizing the feeling of immersion within the movie, beyond the limits of audio and video. More than 610 Hollywood and local titles have been screened in 4DX. To date, more than 71,000 4DX seats operate in 616 auditoriums, spanning 62 countries. 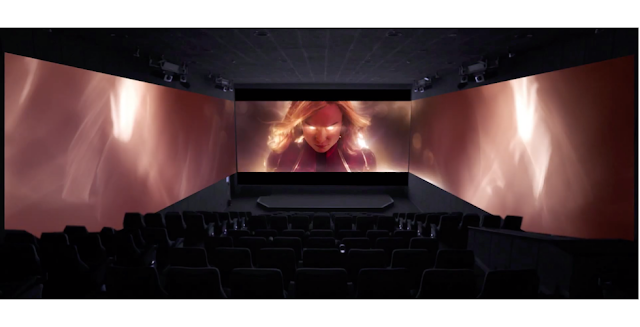 ScreenX is the world’s first multi-projection theater technology used within a theatre setting, marking it as the most visually immersive theater experience of CJ 4DPLEX. ScreenX allows moviegoers to go beyond the frame of the movie screen by utilizing a proprietary system that expands images of feature films and pre-show advertising to the left and right walls of the theatre, creating an immersive, panoramic, 270-degree viewing experience. To date, ScreenX has been installed in 200 screens around the world, including 87 screens in South Korea; 66 screens in China; 16 in the United States; 8 in England; 4 in Turkey; 4 in Japan; 3 in Switzerland; 2 in France; 2 in Vietnam and 1 in Spain, Hungary, UAE, Kuwait, Thailand, Indonesia, Israel and Canada. what a very cool experience! !